The US Air Force has grounded a fleet of F-35s after the aircraft started starving their pilots of oxygen. The 56th Fighter Wing at Luke Air Force Base in Arizona suspended all F-35A flights last week after five pilots experienced hypoxia-like symptoms. 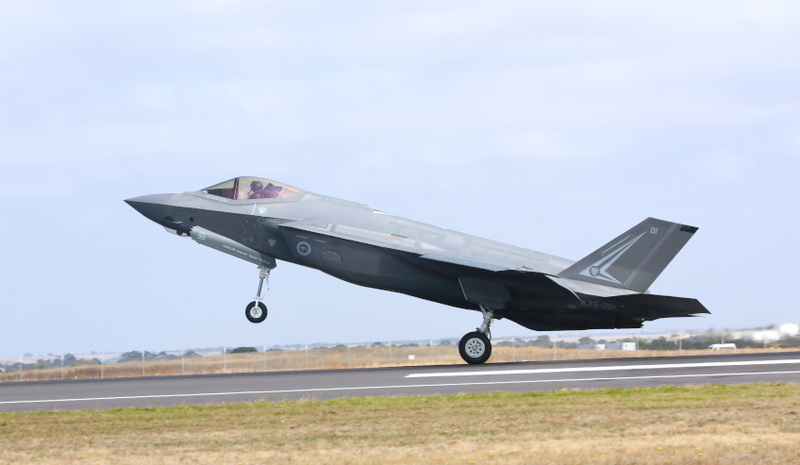 Australia's F-35As are among the 55 aircraft grounded, with the grounding currently indefinite. US Airforce spokeswoman Major Rebecca Heyse said in a statement, "The 56th Fighter Wing will continue their pause in local F-35A flying to co-ordinate analysis and communication between pilots, maintainers, medical professionals and a team of military and industry experts. "This co-ordination will include technical analysis of the physiological incidents to date and discussions on possible risk mitigation options to enable a return to flying operations." Five incidents have been reported since 2 May with pilots experiencing hypoxia, but the Air Force said pilots all used their backup oxygen to land the planes safely and without serious harm to themselves. While there are other F-35s based in Japan and Europe, the grounding is only specific to the Luke Air Force Base as no incidents have been reported elsewhere. Australia will have 72 F-35As with the full fleet in service by the end of 2023. Two, AU-001 and AU-002, have been delivered and each cost more than US$120 million. The F-35s are no stranger to controversy, with much criticism over costs and timing of the program. While in Australia for Avalon Airshow, former head of the F-35 Joint Program Office Lieutenant General Christopher Bogdan addressed some of these controversies, noting “there has been a lot of controversy about how late that program is and completing that program, and how much it costs to complete that program". "Back in 2011, this program was re-baselined, it was re-baselined because in prior years we have not done such a good job on the program. It was many years late, and many millions of dollars over budget, so in 2011 we re-baselined the program," Lt Gen Bogdan said. The Lieutenant General also conceded there are ongoing risks to the program, including with the performance of some of the current aircraft. "We have risks, we have things we have to sort out. There are challenges ahead," Lt Gen Bogdan said. Despite the positive performances of the 200 aircraft in the field, Lt Gen Bogdan expressed his concern and disappointment with the performance of the older aircraft. "The aeroplane today, the 200 aeroplanes out in the field are performing fairly well. Unfortunately, our older aeroplanes that came off the production line some years ago are not performing as well as the newer aeroplanes," he said. "If you took a look at our newer aeroplanes compared to some of our older aeroplanes, you would see a very significant improvement in their aircraft availability, and their reliability and maintainability. That's a good thing, because what we're doing is we're building newer aeroplanes now, and eventually when we modify those older aeroplanes up to the standards of the newer aeroplanes, we'll have a fleet that's fairly robust." Lt Gen Bogdan went as far to declare the reliability and maintainability of the older aircraft as "flat", and said there is much room for improvement, particularly in comparison to the newer aircraft. "Unfortunately, today, the aircraft availability, the reliability and maintainability of the aeroplane is what I would call flat. It's not bad, it's just not getting a whole lot better really fast. Now if you separate out those good aeroplanes, they are getting better faster, but not if you include the older aeroplanes, and we have to work on that. That is a challenge we have on the program, that is a risk on the program, because we need to continue to drive the cost of flying and maintaining the aeroplane down, lower and lower each and every year." Lt Gen Bogdan also cautioned about the ramp up of the production line, fearing the workload of the manufacturing companies. "I'm worried about that, the ramp up of some of the aeroplanes coming off the production line, while at the same time we have 200 aeroplanes out in the field that we have to support," he said. "Because those companies that are building pieces and parts for the production line, are the very same companies that we're turning to, to fix older parts on the aeroplane. There is a natural tension and a capacity issue with those industry partners in building new parts for the production line, and fixing the older parts on our aeroplanes in the field. That's a risk, that's a problem we have to work with." The F-35 aircraft is the most expensive in history, with the 72 F-35As ordered by the Australian government is expected to cost $17 billion.